As evidenced by the photo above, I’ve got a modest amount of experience with off-roading and rock-crawling. Much of that experience has been carved out in the mountains and deserts of California, the jungles of Belize and Mexico, the snow and ice of Tahoe, and the legendary sandstone of Utah. There are certain attributes that you become concerned with when you abandon the subdued pavement of suburban streets for the untamed terrain of the wild. Required Disclaimer: While I’ve gone on adventures with Jeeps, Toyotas and Landcruisers, in some of the burliest landscapes in the world, I’m by no means a professional, and you should definitely consult a professional (and your car and/or life insurance adjuster) before considering taking your life and your Ford Fiesta into your own hands… You’ve been warned! Everything else you do builds upon that one goal. “Traction” is one of those concerns, and how you go about setting the proverbial “rubber to the road” alters severley depending upon the terrain. Fully inflated (or even over-inflated) tires are ideal on the highway, they result in less friction, less engine wear, better handling and better gas mileage (and make your tires last much, much longer). However, fully inflated tires are a liability on sand, rocks and even snow. The reason for this is simple. When a tire is fully inflated, it forms a near-perfect “doughnut”–a circle, if you will. While the rock-hard stability of a tire is great for the freeway, it results in a very small contact patch with the terrain. A fully inflated tire may only touch the ground with 10% of the tire’s surface area, resulting in very low traction. The first thing an avid off-roading enthusiast will do (as will someone about to adventure into sand or ice) is lower their tire pressure. In so doing, the tire is turned from a doughut into a semi-circle with a flat bottom where it places pressure on the ground. In essence, the tire becomes a rubber tank-track. This increases the surface area in contact with the ground (and thus friction and traction) by a factor of up to 400%, as well as allowing the tire to “flow” over the irregular shapes of rocks and boulders, gripping everything it touches. The recommendation I’ve been told by top off-roading champions is that you want your tires at around 7-10 psi. Any lower and you risk the tire pulling off the wheel (a real danger as well). This is also why tires may come with “bead locks” which attach the tire to the wheel… regardless of tire pressure. While it’s possible to go offroading with a 2 wheel drive vehicle, your chances of getting out of a bind increase exponentially when you have a four wheel drive vehicle (4×4). This should be pretty obvious, but if you’re driving a rear-wheel drive vehicle and the rear wheels get lifted off the ground (or slip on ice) the additional thrust that a four wheel drive vehicle would give to the front wheels will help get you out of a bind. 4×4 vehicles have much better control in rain and ice as well, as all the wheels are dispersing the thrust from the engine evenly, making it much less likely that you’ll spin your tires, and thus your car. The next serious modification that most off-roading enthusiasts seek is the ability to lock one or both differentials. The differential is a mechanism that sits in the front and rear axle, and allows the left and right side of the axle to turn independently, while sending thrust to both wheels. Why is this necessary? Well, without this invention, you’d be skipping all over the road every time you turned the wheel. The reason is simple: when your car makes a turn, it carves two circles with the left and right wheels. Imagine a vehicle making a u-turn. The driver-side wheel makes a small u-shape, and the passenger side wheel makes a large U-shape. By the end of the u-turn, both wheels have traveled a different distance in the same amount of time. Doing this smoothly is only made possible with a limited slip differential. Without a differential, the inside wheel would have to skip and stutter in place as the outside wheel spins the greater distance of the outer curve. The differential “slips” for the inside wheel, and transfers thrust to the wheel with less resistance – the outside wheel that is travelling the greater distance. This works GREAT while on the road and going through curves. But it’s a huge liability off-road. Why? Because a differential is designed to send thrust to the wheel with the least resistance, it means that when a wheel is off the ground (as often happens when climbing obstacles off-road) the thrust is sent to the wheel that is off the ground. The wheel that is securely kissing the ground gets no love at all… it just sits there like a turd. With a selectively LOCKING differential, the driver can “lock” the differential so that it no longer transfers thrust to the wheel with less resistance. 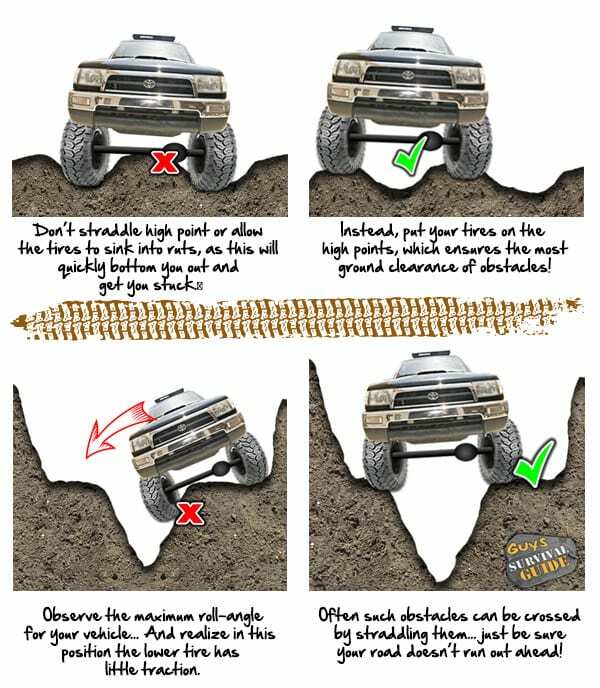 The axle becomes like a solid rod, and BOTH wheels get an even thrust from the engine… This allows the one wheel that is touching the ground to roll the vehicle out of the tight spot and keep you moving forward! Just like with racing cars, offroading requires you to be smooth in your controls. If you suddenly “gun it”, especially in low gears required for rock-crawling, you’re going to spin your tires and go nowhere… same goes for dirt and especially ice and snow. If you jam on the brakes, you can slide out of control, or even roll your vehicle. When you turn the wheel, and apply gas or brakes, you generally want to be very smooth. And the same steering technique I was taught for stunt-driving applies to off-roading: shuffle steering. You don’t want to wrap your thumbs around the steering wheel, as the wheel can be rapidly whipped around by obstacles, and can break your thunbs (plus sudden-impacts with immovable objects like rocks and marvel super heros can also cause your thumbs and wrists to break). Steering is subtle and controlled… this isn’t a race, it’s a journey and an adventure. There are a number of ways to get over obstacles. Ideally, you want to approach the obstacle so that both of your front wheels are kissing it at the same time… this puts the most rubber to your obstacle and will multiply your friction and traction. You can roll up gently to the obstacle, and just as your wheels kiss it, you “bump” by giving a slight rev of accelleration. This is NOT jamming on the gas, it’s just a bump to keep your momentum moving forward and roll you over the obstacle. As soon as you get rolling over it, it’s SO important that you KEEP moving. If you stop, you may loose momentum and not be able to regain, resulting in becoming stuck, sliding off, or other similar things. In the video at the bottom of the page you can see me approaching quite a few obstacles with this “kiss and bump” method. It’s very effective. Path selection is also important. You want to take a look at the underside of your vehicle and see where your differentials are. The differential will look like someone built a small death-star on the axle that connects your two wheels. Because the differential is usually the lowest part of the vehicle, it’s important to know it’s location so you can keep from slamming it into obstacles. When driving off-road, it’s important to keep one tire on the high-point of your path. This protects the underside of the vehicle from damage and keeps you from getting stuck “in a rut” (literally). There’s a lot of additional equipment that can help you when you off-road. 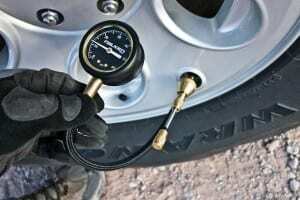 If you deflate your tires, a compressor can come in handy when you’re ready to rejoin the pavement. A “high lift jack” allows you to change tires and even jack your way out of trouble, even with a lifted vehicle, or a vehicle that is at an odd angle and far from the ground. A winch allows you to pull your way out of many bad situations by using a motor and gears with unbelievable pulling power. They also aid in rescuing others. Extra gas cans, a fire extinguisher, GPS, CB radio, first aid kit, additional axles and cv joints and boots… the list goes on and on. You don’t need all of this to do simple off-roading, but the sport is addictive… it’s literally a slippery slope! I started my off-roading adventures by simply hopping into my trusty 4-runner after 9/11 and going on a 5-week road trip across California, Nevada, Arizona and Utah… I visited 9 national parks, shot a lot of photos, and made a lot of mistakes that probably should have got me killed. One of those was trying a trail in Utah called “poison spider” that seemed impossible at the time. I tucked my tail and turned around, and almost slid off a vicious cliff in the process. Last year I had the opportunity to go back to the same trail with AEV during the Easter Jeep Jamboree… It was amazing what a difference the right knowledge made.